Amazingly, given the low overall mintage for the Year 1802, five separate die varieties were coined featuring the date with the numeral "2" stuck overtop of an previously punched "1." Certain of the varieties have the date widely spaced, and others show the date as narrowly spaced. The appearance of these overdates is unmistakable, even to the naked eye, and this has made these varieties all the more popular with collectors. 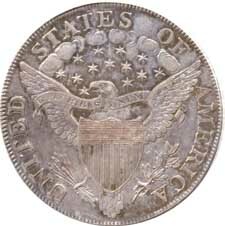 The Cardinal Collection includes specimens of both of these important sub-types, including a high condition census (AU58) specimen of the BB-232 narrow date variety, in addition to the pictured coin. 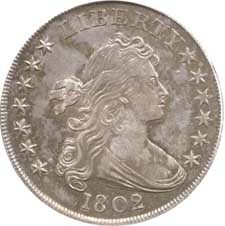 At MS63, the pictured coin represents the second finest 1802/1 dollar ever graded, as well as being the second finest of the BB-234 variety. Toned in original shades of blue and gold, the surfaces are smooth and lustrous, and the strike is as sharp as ever seen.